SASCOC held a banquet for the 62-strong South African Paralympic team before they left for London on their quest for gold. Seconds out, round No 2! From my first column, “SASCOC not fit to run SA sport”, we box on against a heavyweight administration that punches low below its weight. But they won’t go down without a fight. Kobus Marais, a DA politician, who reports to SASCOC CEO Tubby Reddy commented on the first column. (Apologies for the spelling errors but that is a direct quote from Mr Marais) - perhaps, no spell check on the PC’s at SASCOC! Mr Marais, please could you stipulate which are the lies, which are the assumptions and the rumours that have jeopardised our athletes. Who are you trying to kid by saying “our athletes who all give credit to SASCOC”? The athletes are between a rock and a hard place and would be committing career suicide by criticising the sporting body that is “supposed” to look after their best interests. Furthermore, the athletes had to sign a code of conduct before the London Olympics, which forbids them from criticising or chastising SASCOC for six months after the Games. The individual sporting federations also rely on good favour from SASCOC for money (and therefore, their futures). So, any noise will be squashed or the individual will be worked out the system very quickly. Corporate SA can only do so much. Without Investec’s continued financial support, the SA women’s hockey team would not have made it to London 2012. But during the Olympic build up and the Games, the Investec brand could not be associated with the team. SASCOC want corporate SA involved but then chase them away in the most crucial time. It’s almost like US Postal sponsoring Lance Armstrong but not allowed to be associated in the months prior to or in anything associated with the Tour de France. Lance Armstrong may not a good example right now but it kind of changes the dynamic for a corporate sponsor, doesn’t it? The problem with uncovering any of this is that it is all contained in a self-preserving system and SASCOC will always be protected by Dept of Sport and Recreation on a government level. Mr Marais went on to say, “someone at SASCOC must have ‘deprived me’ from benefits owed to me”. That is a pathetic political deflection, which we have been accustomed to in SA but what we are “deprived” of is an open, honest sporting administration that looks after the best interests of our athletes. Ironically, it is the same Mr Marais, who is now at the centre of the current controversies raging in PowerboatingSA (PSA). Mr Marais is an administrator of PSA (due to the federation’s SASCOC “suspension”) and he allegedly took it upon himself to deny SA Inflatable teams including the defending champions from racing in the World Championships in Norway recently. He was also part of some “secret” meetings with UIM that saw PowerboatingSA lose out on hosting the 85th general assembly of the UIM (400 delegates) and the Formula 1 Nations Cup in Durban. Both events could have been worth some R30 million in foreign spend to SA. The F1 Nations Cup would have been over three years. Meanwhile, the power struggle continues and PowerboatingSA has a couple of legal cases pending against SASCOC, which have been dragging themselves out in court. To be honest, I’m not sure if PowerboatingSA is suspended or under administration but I guess SASCOC own the federation until they decide otherwise. SASCOC likes to bully the small federations until they have an iron grip, with one of their “boys club” in control. The weightlifting and SA Equestrian rider selection controversies for London 2012 were sad to say the least and SASCOC didn’t exactly cover itself in glory with either. With regards the latter, the Court of Arbitration for Sport in Lausanne found that the behaviour of SASCOC and the Equestrian Federation was unethical and in breach of the Olympic charter. They were also handed a hefty costs order. I wonder where that money will come from? SASCOC is a Sec 21 company and they preach good governance and accountability to the sporting federations but do they practice what they preach? The Public Protector is currently investigating SASCOC’s shareholding in horse racing in South Africa and where there is reason to believe that there is a lack of accountability and misuse of public funds. 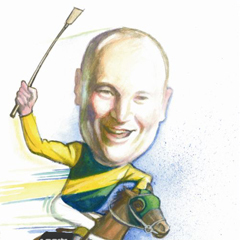 Grinde Investments (Pty) Ltd, a commercial arm of SASCOC holds a 5% shareholding in Phumelela and the president of SASCOC, Mr Gideon Sam is a trustee of the Thoroughbred Horse Racing Trust. But believe you me, there’s no “horsing” around when it comes to the salaries of some SASCOC officials. CEO Tubby Reddy is earning R148 000 a month. Can’t be many sec 21 companies CEO’s who earn around R1.7 million a year. Still bewildered how the position of SASCOC CEO and CFO (occupied by Vinesh Maharaj) were never advertised and no due process was followed in the appointments. Also, Mr Reddy is still the president of Volleyball South Africa and Mr Maharaj is the treasurer of Volleyball South Africa? Not a conflict of interests? They’ve got the “iron grip"! And can someone please tell me why the SASCOC big wigs flew on Emirates to London, separate to the team (business class of course)? Would it not be good business acumen or common courtesy to use the airline that is a major sponsor of the SA Olympic team. If I was the CEO or marketing manager of SAA, SASCOC would be grovelling right now and flying Nationwide! To quote the sports minister, Mr Fikile Mbalula: “You bring back glory, we treat you as a king. You bring back mediocrity, we'll pretend we don't know you." Looks like the hockey girls got the short end of the stick, no pun intended. SASCOC made the SA women’s team leave the Olympic village before the hockey competition had finished and they were not allowed to attend the closing ceremony. Yes, I understand their games were over but if the closing ceremony is not for the athletes – who is it for? And don’t you worry Mr Marais, I have a lot of bees in my bonnet and they are swarming! As a sports journalist, I published the articles after making extensive investigations and not as a personal attack. From the comments below my first column, you will see that there are a growing number of people that are frustrated by the workings of SASCOC, of which you are the president. I am not the lone voice. If there is anything that is inaccurate in either of my two columns, if you can provide me with evidence, I will gladly publish it. I also invite you to be my guest on SportsFire and will offer you a full hour to answer all questions in the interests and betterment of SA Olympic sport.